No matter your reasoning for using rat poison, the health and wellness of you and your dog comes first. Dogs are naturally curious creatures. Accidents can and will happen when using rodenticides. If you are concerned that your canine may have gotten a bit too curious, please take a moment to read through our guide to find what symptoms to look for and what you can do to protect your pup from future accidents. 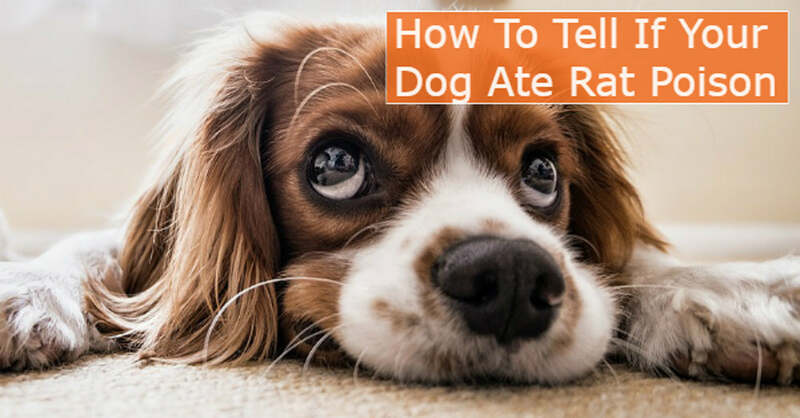 If there is any concern that your dog may have eaten rat poison, please call Poison Control at 1-(800)-222-1222, the Pet Poison Helpline at (855) 764-7661, or visit your nearest animal hospital immediately. Depending on what type of rat poison your dog ingested, the warning signs can vary. The most common ingredients in rat poisons today are ACR’s, Cholecalciferol, Bromethaline, and Phosphides. Let's a look at each to understand the different reactions and possible treatments. This poison prevents blood clotting resulting in internal bleeding. Symptoms may take up to 3-5 days to notice unless your dog has been chronically exposed. A veterinary prescription of Vitamin K1 is the best treatment for this kind of poisoning. Most dogs will need to take vitamin K1 for up to 30 days after the ingestion of ACR. Over- the-counter medications and food supplements with vitamin K1 will NOT be enough to help. This is one of the most dangerous types of poison as only a very small amount can be lethal. Cholecalciferol poisoning is expensive and difficult to treat. It is a challenging rat poison to treat among vets. There is no specific antidote but for the best possible outcome, aggressive IV fluid injections will be necessary to flush out the kidneys and return the calcium levels back to normal. Animals will typically need to be hospitalized for up to a week. This type of poison causes brain swelling and unfortunately, does not have a specific antidote. Do not mistake this poison for an ACR (brodifacoum, bromadiolone, etc.). While the names look similar the treatment is NOT. Bromethalin poisoning does not work by clotting the blood so it cannot be treated in dogs with Vitamin K1. Symptoms typically develop within 2 hours but can take as long as 36 hours to notice. Possible treatments for this kind of poisoning include inducing forced vomiting, administering activated charcoal and an osmotic cathartic to release the dog’s bowels, and IV fluid flushing. Some medications may be prescribed by your vet such as anti-seizure medication and muscle- relaxants. Treatment can take up to several weeks. Typically used to kill larger creatures such as moles and gophers, this type of poison can also be dangerous to you and your family. While this is a less common poison, it does produce a toxic gas in the stomach of your dog that can potentially harm humans. If vomited in a non- ventilated area, inhalation of the toxic fumes can cause lung-irritations of all who inhale it. Cutting your dog off from all food is important after the ingestion of Phosphides because food consumption increases the production of toxic gasses in the stomach, therefore making the poisoning even worse. Immediate professional care should be sought out as there are no specific antidotes for this kind of poisoning. Other possible treatments include inducing vomiting, pumping the stomach, administering antacids, and IV fluid flushes. There are a few things you can do to prevent your furry friends from getting into the poison traps in the first place! Consider these precautionary steps before you decide if and where to use rodenticides. There are a varierty of other methods to practice safe rodent control that don't employ using rodenticides. If you want to avoid harming your pets, abstaining from rat poisons is the first step! This is made a bit easier if you have a larger dog but when it comes to small dogs you have to get creative with your hiding spots. Put yourself in your dog’s position. If you can easily grab it with your hand, they can just as easily grab it with their mouths or paws. Make sure the cage is large enough for rats but too small for your dog and other pets. Whether your dog is inside or outside, keep a close eye on your beloved pet. Dogs are very curious creatures looking to get their paws into whatever they can reach. If you begin to notice any peculiar behaviors in your pet, make an appointment with your vet as soon as possible. Please call the nearest animal hospital immediately to set up an emergency appointment if your dog has any of the symptoms listed above. It can be difficult to determine what our dogs are feeling but what they lack in words they make up for in actions or lack thereof. Never hesitate to get a professional opinion. What can seem like an upset stomach or lack of energy has the possibility of being so much more drastic and life threatening.